The Vision T9300 HRT treadmill is similar to the cheaper Vision T9200 but with programmed workouts. This is actually the cheapest treadmill in the current Vision lineup that comes with workout programs. 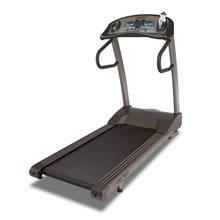 If you’re looking for a basic treadmill that can offer some decent workout variety, then this is the model for you. Plus, it is built from Taiwan so you can expect its price to be very affordable. As I’ve mentioned above this machine comes with a variety preset workouts. These workouts include User Programs, Manual, Heart Rate Training, Interval, Weight Loss, Speed Walk, 5K Run, and 10K Run to keep you motivated. This treadmill boasts a 2.5HP continuous duty Cambridge motor that has a speed range of 0.5-10mph and an incline range of 0-12%. This motor is perfect for both beginners and intermediate runners who love intense running. And finally, it comes with great home warranties. It has a lifetime warranty for the frame and motor, 5 years for electronics and parts, and a year for labor. These warranties are pretty impressive especially since this model is being sold for just around $1,500. The biggest weakness of this machine is that Vision used wax for this unit’s tread belt. Although wax reduces maintenance, it also causes more wear and tear on your treadmill that would eventually lead to more repair costs in the future. I would recommend the Vision T9300 HRT treadmill if you need a low-cost basic treadmill with programmed workouts. However, if you’re going to spend $1,500 for a treadmill, you’ll be better off buying a Smooth 7.1HR treadmill. It is cheaper than the T9300 and has more value to offer for your money. If you plan on buying a Vision T9300 HRT treadmill, I suggest you buy it at vision. They offer the best price around the net. You can get it for just $2,199.